Adams Drugs is giving free vitamins to all school aged children at no cost. The program requires the parent to fill out a simple sign up sheet and the child will receive a 30 day supply of chewable vitamins for 1 full year. Ask the cashier for the form to fill out and you are on your way. When you run out, you simply return to the store to pick up your next bottle. 6-9 pm Prattville's 3rd Annual Back To School Concert Featuring Once Over Twice FREE Food Vendors and kids activities will be available. Clint Darby and the Booker T. Washington Magnet High School Concert Choir will bring the third annual Auburn University at Montgomery Summer Concert Series to a close on Aug. 17. The public is invited to attend the inspirational event, held 6-8 p.m. on the AUM quad. Admission is FREE, but guests are encouraged to bring a non-perishable food item for the Montgomery Food Bank. Outdoor games and activites will be offered for the kids, including sidewalk chalk, bubbles, and coloring pages. Summer concert guests should bring their own lawn chairs and picnic blankets for the outdoor concert. Outside food is welcome, but Boomer T's Barbecue will sell hamburgers, hotdogs, barbeque sandwiches, loaded nachos, drinks and snacks. In case of inclement weather, festivities will be moved to the AUM Baptist Campus Ministry. For vendor prices see the AUM Summer Concert Series website. 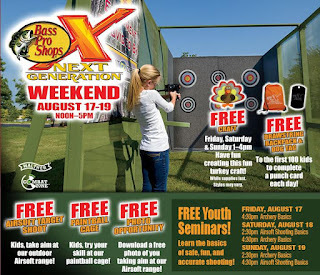 August 17-19, 2012 is the Bass Pro Shops Next Generation Weekend during their 2012 Fall Hunting Classic. 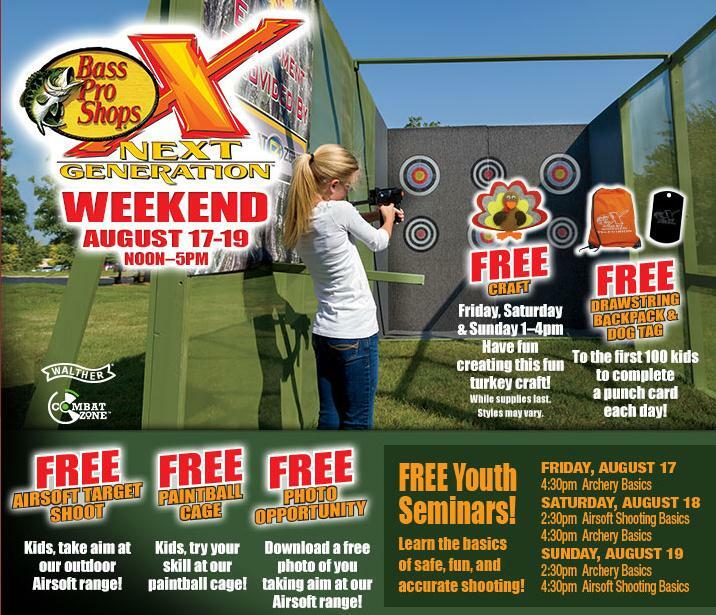 First 100 kids to complete a punch card each day get a FREE drawstring backpack and dog tag. Toys R Us has a HOT $5 off any in-store purchase coupon on their website right now. Just head over to their homepage and wait for the banner below or look for the "Save $5 On Your Purchase" on the right hand side of the screen to get this HOT one-time use coupon. There are several exclusions but no minimum purchase, so you should be able to get $5 worth of stuff for FREE! Coupon expires 8/16/12 and it's one coupon per "guest." But it looks like you can only print one from each computer, because I printed more than one and it had the same barcode (which I presume means that I can only use one.) You may be able to print ones with different barcodes if you use a different browser (ie. Google Chrome, Firefox) but I haven't tested it. There are several great coupons out for today at Earth Fare! Email Coupon (Good only for select stores-Montgomery included.) 50% off hot bar or salad bar. Expires 8/13/12. One plate per coupon. 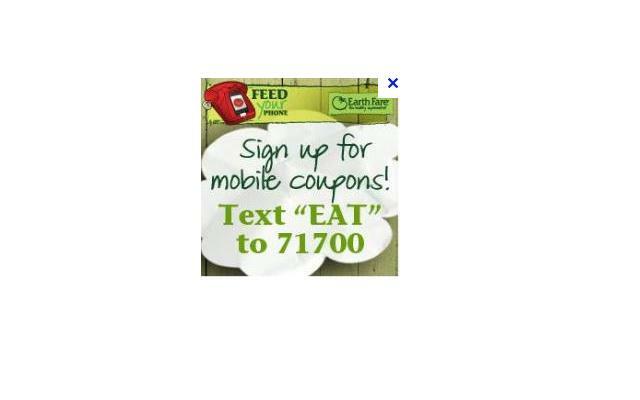 Go here to sign up for Earth Fare emails. Earth Fare Welcome Home Weekly Reward coupon. Free 1/2 gallon Organic Valley Milk with $5 purchase. Expires 8/12/12. Take the Earth Fare Boot Challenge for a coupon to trade gummy candy with artificial ingredients for a bag of Yummy Earth gummy bears. Text Coupon: Free Crofters Jelly (any flavor) with $5 purchase. PLU80461. Expires 8/11/12. One coupon per mobile. An awesome new Earthfare coupon came out today!!! I love it! $5 for 5 organic items!!! Peanut butter, Jelly, Cookies, Crackers and Apple Sauce. This is a great price for these items, especially the peanut butter and applesauce. The coupon MUST BE PRESENT (unlike previously when it was okay to write down the number and exp. date) so make sure that you print this coupon to bring it with you. Just sign in or sign up for an Earthfare Welcome Home account to access the coupon! Expires 8/5/12 and while supplies last, so hurry in. You can bet every "customer" in my household will be using this coupon to stock up!